I've got Judy Martin's Three of a Kind up on the wall. I'm six blocks away from having all of the center ones done. I still need 34 of the outer squares, but I have most of them cut and ready to go. A few more weeks, and this one will be added to my done list. This is going to my May UFO, and I'll link this post up to the May goal setting party at The Lovely Year of Finishes when it goes live. My main focus for the past week, however, is getting this sampler quilt done. It isn't going to be displayed to anyone except us, since it is full of trials of new techniques for me. This one to the left is a trial of a background fill. And to the right are some more background fill trials. I started off doing these large green triangles with curved crass hatching. I finally figured out how to get the ruler orientated properly in order to get the curves to cross properly. So, I thought I'd try some other fills in the last two. This one to the left is interwoven triangles. And this one has some curves and straight lines and interwoven triangles all in the same place. I've gotten to the point where this quilt needed to come off the machine and be turned to make it easier to do the other 2 sides. 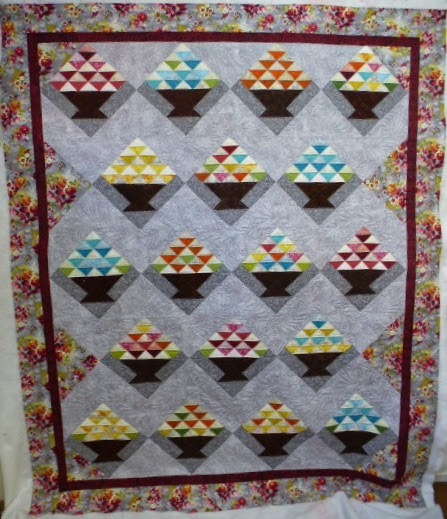 It's going to be set aside for a while, so I can get back to doing some of the customer quilts I have waiting in line. I had scheduled this one of mine in, so I'm not too far behind. I'm linking this post up to Judy's Design Wall Monday. After I post this, I have a round robin to work on. There are four of us working on projects from each other. We are taking pictures of the projects as they come to us and again when we are done with them. We are going to get together sometime in June, I think, for a reveal party to each other. After that, each of us will share our final results, and a little bit about each others' on our blogs. I'm working on Jacqui's this month. Last month I had Gail's and next month I get Christine's. So, I'd better get this posted and get to work on Jacqui's project, if it is going to be done before the next guild meeting. I'm a day behind on my Scrappy Saturday purple blocks, but I finally got them done today. These are my scrappy pinwheels. I'm doing 2 blocks of these each month in the colour of the month. I'm challenging myself to use the complimentary colour in the 2 inch squares and the outer framing. These have added a bit to mu used column in my stash report. Unfortunately, I went to a quilt show on Friday, and added a little bit. A bunch of black and white fabrics, only fat quarters, jumped into my hands and insisted on coming home with me. I have plans for them, really fun plans. Teresa, at a Quilt and a Prayer is making some really fun blocks that she's called Happy Dance. I love the design, and the colours and everything else about the blocks she has, enough that I'm collecting fabrcis so I can make my own version. I'll be linking up to Judy's Stash Report. Well, actually, it was a last weekend finish, that I said I was going to post a picture of on Monday. But, as usual, the week got away from me, and here it is Friday, already. Last weekend, I finished the second UFO in a month, and got it to the flimsy stage. It's a McKenna Ryan design called In Full Bloom. There are a lot of little teeny tiny pieces cut and fused on this thing. And now that it is to this stage, it obviously has to be quilted. All of the flower petals in this picture to the left are all individually cut and fused.... yes, I know, I'm insane. And now, they all have to be quilted down. This one has me scared, because I'm not too sure just how well my machine will handle the layers of fusible. I used Steam-a-seam lite, so it isn't really stiff and thick, but there are some areas with four or five layers. I have done some wall hangings in the past that have had fusible on them, and my machine has hated them. But I've done a few of my own using the same fusible product as in this one without too much trouble. 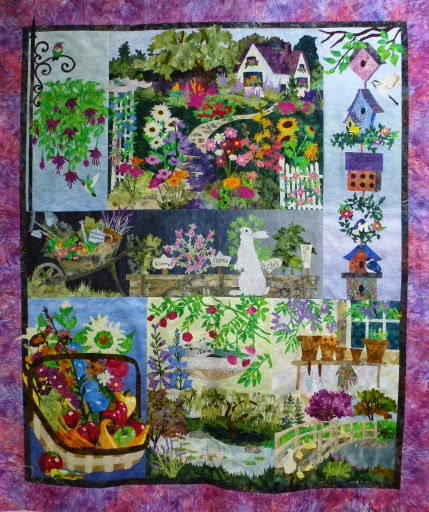 I think this block with the hanging planter and the humming birds is my favourite of the whole quilt. I have made one decision about the quilting for this quilt..... it will have a print fabric on the back to hide any possible tension issues developed from the layers of fusible. Oh, and I've made another decision.... I'll use invisible thread in the top so I don't have a million thread colour changes, and very fine Bottom Line thread in the bobbin, probably a taupe or a grey. Past that point, I'm doing an awful lot of pondering and thinking about how to tackle this thing. It's a couple of months away from being tackled. Hopefully, I'll come up with a solution by then. If not, I'll dive into it, and hope for the best. I'm going to link this post up to Finish It Friday at Crazy Mom Quilts. I'm working away at a couple of things right now. I'm back at Three of a Kind, a pattern from Judy Martin's book Scraps. I have 26 of these blocks done, so only 10 more to go, plus all the single square units that go around the outer edge. The other thing I'm working on is the quilting on my sampler quilt. I'm using this one as a learning tool for all kinds of things, tight background fills around applique being one of them. I've decided I'm not a fan of McTavishing, although maybe this wasn't a good piece to try it on. From what I've seen, that technique requires larger open spaces than what I have here. But I do like the look of that back and forth "C" shape. It has the added bonus, when done near the applique, of filling the background and outlining the applique at the same time. It took me doing half of the center appliqued area before I discovered this. This could be a very good thing to know when it comes to quilting both Cactus Rose and In Full Bloom. I've also added those three in one bubbles to my repertoire, and I am trying very hard to master curved cross hatching. Who would have thought it was so hard making sure the ruler was turned the right way? So far, I have one out of the four sections that I've done that are done correctly. This one is right. This one is wrong. Because I've decided this is a learning piece, and not a show piece, there will be no ripping. It will be a graphic lesson in how not to do it. I'm trying new techniques inside the sampler squares, as well. The royal blue background in all the sampler squares are testing other very dense fills. I like the way it is making the pieced portions of the blocks stand out. But, it is all very time consuming. I'm giving myself to the end of the week to finish this. If it's not done, I'll take it off, and work on the quilts I have waiting for customers. I think I'll spend the rest of this evening working on more Three of a Kind squares, and then later on, some knitting. First of all, I'd like to wish everyone a blessed Easter. Christ the Lord is risen........ hallelujah!! We are having a small family dinner tonight, ham and scalloped potatoes and cole slaw. It's all in the oven, and it's starting to smell rather good around here. I've been busily sewing and finishing things this past week. A little of that shows in the stash report, but most of it was counted before, or started long before I started keeping track of stash usage, so to count it now sort of feels like it's cheating, although I don't really know why. Hopefully, this week I'll get back into the black. I have plans for doing sewing that actually uses stash while finishing projects. I did finish 2 this week, one of which I blogged about here. The other one, I'll show some pictures tomorrow. I have a leaders enders project that is to the assembly stage, and then I also want to get back to Three of a Kind, both of which will add to my yardage used stats, hopefully enough to off set the fabrics that I know will be coming home with me from a quilt show at the end of the week, as my collecting of black and white fabrics continues. I'm linking up to Judy's Stash report. Then, I'm going out to sit and knit in the glorious spring sun. Happy Dance... Cactus Rose is a finished top!! I'm in celebration mode! Can you hear me cheering?!?!... this quilt is finally finished. I have been working on this pattern, called Cactus Rose, a design from Judy Neimeyer, for at least five years. I first wrote about it on the blog here, back in February of 2010. I would work on it for a while, get overwhelmed and call for the men in the white coats to come and get me, and then put it away for a while. It was on my finish it list for last year, and didn't get touched. I was determined that this was going to be the year, and here it is! Yippee!! Woohoo!! Whoop whoop!! Here's a closer view of one of the corners. This whole thing, as in all Judy Neimeyer designs, was paper pieced, and then hand appliqued. The background was done using four of the very light shades of the Fossil Ferns fabrics. I think the original used a batik. And here's a close up of one of the center blocks. There has been so much nail biting, smothered bad words, and all kinds of stressful wondering why on earth I ever thought I could do this moments while working on this quilt. And it was all worth it! This one is moving to the very top of my to-be-quilted-next pile. I'm going to link up to some celebratory linky parties with this one. Finish it Friday, Can I Get a Whoop Whoop and Link a Finish Friday. I'll also link up this post to The Lovely Year of Finishes Party at the end of the month. I entered this as #75 in the goal setting party. The next time I write about this quilt will be when the quilting is started on the long arm.. I'm so HAPPY!! I brought my computer up to the studio today with the thought of posting shorter posts, but more often. Alas, the internet connection up here is worse than downstairs. So, I'll have to make do with iPhone posts. I loaded one of my own quilts, the Pieceful Kwilter BOM I did four or five years ago. I am going to try out a bunch of new things in this one, starting with the curved ruler, piano keys and filler in the border. The textured fabric makes it kinda hard to see what I'm doing, but it will also hide any goofs I make while on this learning curve. I'm sitting here at my computer with my second cup of coffee. That means I have some clarity of thought. Enough to have decided that I really have to come up with a way not to procrastinate things I want to write about here. It seems that, once I am up and truly moving, after finishing said second cup of coffee, I get so busy that, although I think about sitting down to write, I don't actually do it. So, I'm going to try and do some posts at this time of day, and see what happens. The other thing that's been going on preventing posting to the blog has been atrocious internet service lately. It takes forever to load stuff, or the signal is dropped right in the middle of what we are trying to do. Uploading pictures takes what seems like forever. DSIL is going to call the provider and see if they can't come up with a solution for fixing the high speed internet that isn't high speed by anyone's definition of the word. There, that's my complaint for the day. This is one of Charlene's quilts. It's an Edyta Sitar pattern from one of her books, although I don't know which one. 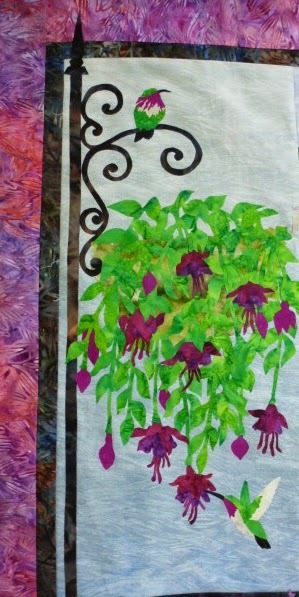 I love the colours and fabrics Charlene chose for this quilt. The floral is lovely, and the greys work beautifully to highlight all the colours in the baskets. The greys she used in the basket blocks makes them look like they are casting a shadow, and give the piece a lot of depth. The top part of the baskets got continuous curves, and the baskets themselves got a curvy cross hatch to give the impression of a woven basket. The grey background setting areas got a swirly type feather. I love doing feathers of all shapes and descriptions. The swirls continued out into the narrow red border. 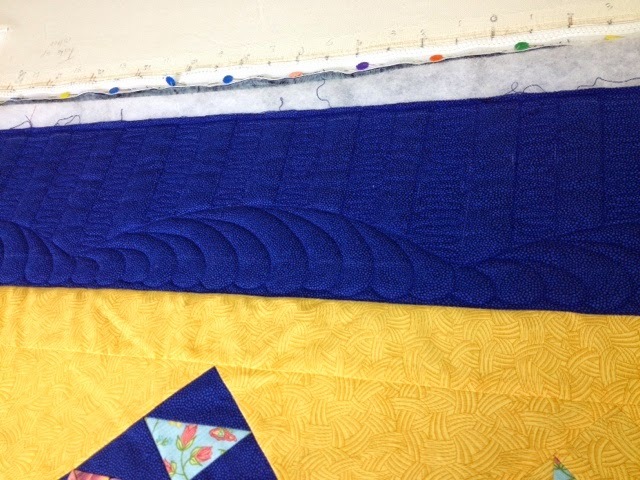 I couldn't get a picture to show up the quilting in the floral border or the floral setting triangles, but it was more of the swirly type feathers. This was a fun quilt to do, from start to finish. Thanks Charlene. Well, I fell off the no buying wagon big time this past week. But It's all for a very good cause. These two fabrics here, to the right, are for Avery's third birthday that is coming up next month. He is a huge Thomas the tank engine fan. So, I'm going to make him some pillow cases and some pajamas, and maybe a valance type thing to cover the workings of the roller blind in his room. The stripe is for the pillow cases and valance, and the scattered trains are for the pajamas. Then this gorgeous diagonal stripe is for bindings. I love me a diagonally striped binding. And then, while blog surfing last week, I came across this post by Teresa and decided that I just have to do some of those blocks, which led to the beginning of collecting black and white prints. I won't be starting it for a while yet. I need to get more of this type of fabrics, and I still have a couple of finishes to take care of. And that brings me to today's slow stitching. I have a little bit of stitching to do on the green stem of this flower on Cactus Rose, And I can declare the hand work part of this quilt done. And, better yet, most of the paper piecing for the rest of the borders is done as well. Another evening should finish that part of it. I just might make that goal of getting this quilt done by the end of this month. So very, very exciting!! Anyway, back to the stash report, since it appears my delaying tactics didn't work. Balance: 1.3 more yards in than out. How on earth did it get to be Friday already? I could swear that I just wrote a post about this yesterday. Today was one of the first days when I could actually get outside for pictures. It is a glorious day, sunny and warm. The snow is all gone from our back patio. All that we need is our chairs and table set out, and we're good to go for some outdoor enjoyment. Although, putting them out now might be pushing it, just a bit. Our neighbour's crocuses are up, and looking so very happy, and looking at them makes me smile. 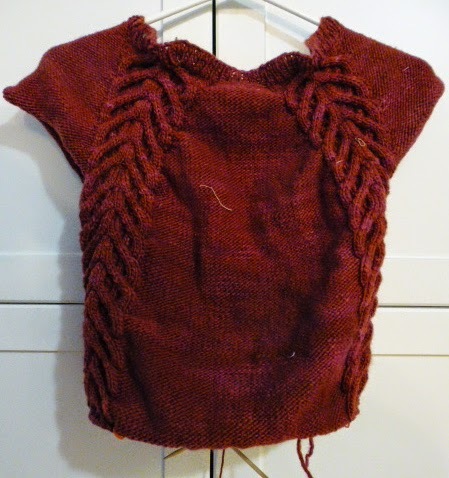 And here's my knitting project, still the Pinery sweater. I'm down to the ribbing at the bottom now. Not much further to go, and I can start the sleeves. I'm linking up to Judy's on the needles. Ok, before I do anything else here, I really have to do the proud mama thing, and share a link to our son Noel's art work. He will be having some space in an art gallery in Post Stanley, Ontario. I am just so thrilled for him!! There, that's done, although I still have the proud mama grin on my face. :-) Now I can get on to the business of a stash report. Balance: 7.8 more yards out than in. eight pairs of strip sets made for the smallest part of the triple four patches I've been making each month. But I'm so bummed out over the rotten tax situation, that I really don't feel like sewing any more. What I do feel like is going out and getting some comfort food.... chocolate cheesecake comes immediately to mind. However, I will behave, and stay home, and cut up these strips into the requisite pieces needed for the four patches..... not anywhere near as fun as chocolate cheesecake. I'm linking up to Angela's Parade of Purple and lots of fun stuff to look at. Here is the Pinery Sweater that I've been working on forever, it seems. Of course, it didn't help that the tension was really off the first time I did it, so I ended up ripping it all out. I'm at the point of doing the shaping for the hips now, so it shouldn't be too much longer. It just might be ready for the first camping trip of the year next month. I'm also working on a new pair of socks, but I don't have a picture of those, just yet. I'm linking up to Judy's On the needles. And then, I just might sit and knit for a while. My goal for this month is fairly simple..... make 18 more of these triangles and get them sewn together and onto Cactus Rose. Sounds simple...... not! The good news is, I have 18 of the bottom quarter circles already done, and nine of the coloured arcs done, and 3 more partially pieced. I still need to do all of the top sections. When this quilt is finally finished I will be doing the happy dance to beat all happy dances. LOL! This is going to a short post, since we are having mega trouble with a very slow internet connection - very annoying! I'm linking up to the goal setting party at A Lovely Year of Finishes.